I have a Classic with 3 PLG boards installed. If you wish to audition sounds then in voice mode, hit the PLG button corresponding to the card you wish to hear on the top right of the board. To use them in a mix can be interesting. Press Song, then Mixing. In the bottom RHS of the screen you will see a tab labelled PLG 1-3. Press this and that will take you to he mix page for the cards you have installed. A couple of notes. From memory, the cards you have are monotimbral. The AN card is 5 note polyphonic and the DX is 16 note polyphonic. What further info are you after?? 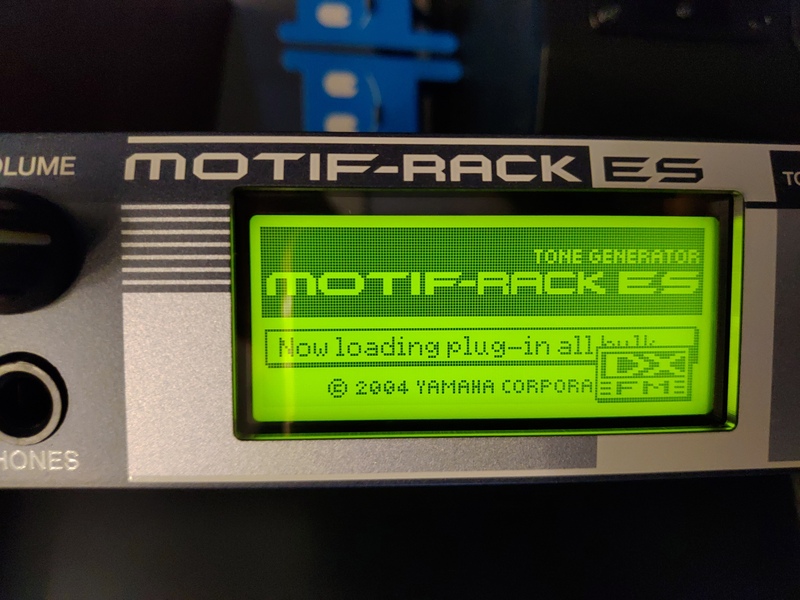 The Motif-Rack ES doesn’t have a built-in sequencer, so you’ll have to use an external one - preferrably running on a computer - to play all of the multitimbral parts. To do so, you’ll have to familiarize yourself with the USB MIDI connection, and the concept of MIDI Ports. Like Wellie says, the PLG cards are monotimbral, and each card can only play a single timbre/part at any given time (except for the 16-part PLG100-XG). Polyphony is indeed 5 voices for the PLG150-AN and 16 voices for the PLG150-DX. The PLG cards can be used both in Voice-, Performance- and Multi modes. In Voice mode, like you described, PLG voice banks are called up by toggling to the appropriate memory locations using the “[<] BANK [>]” buttons. As you may have noticed, the Rack ES doesn’t have the dedicated front panel buttons of its keyboard counterparts to select PLG voice banks. In Performance mode, each PLG card can be assigned to one of the 4 parts. This way, you can create layers/splits with both internal voices and PLG voices pretty much as you please. When editing a performance, select the appropriate PLG bank in the “Part Edit” displays. 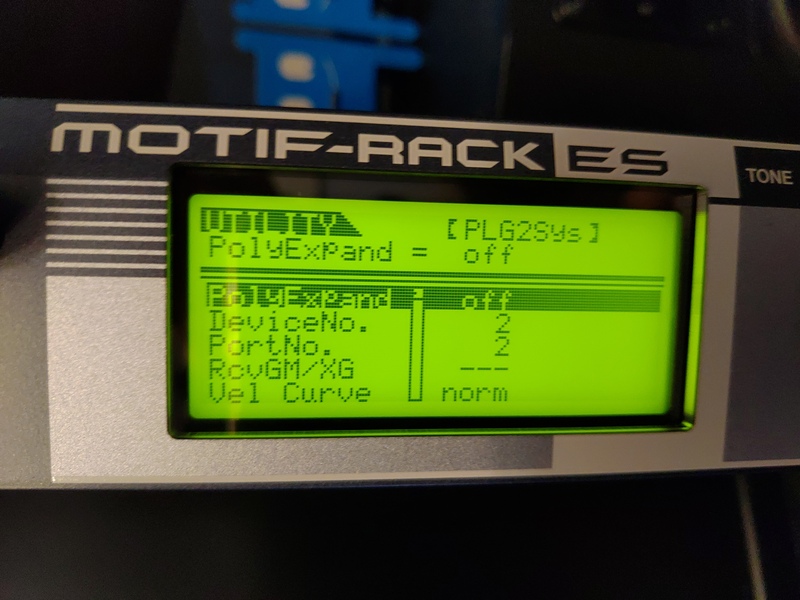 In Multi mode, each PLG board adds a part to your Motif-Rack ES. 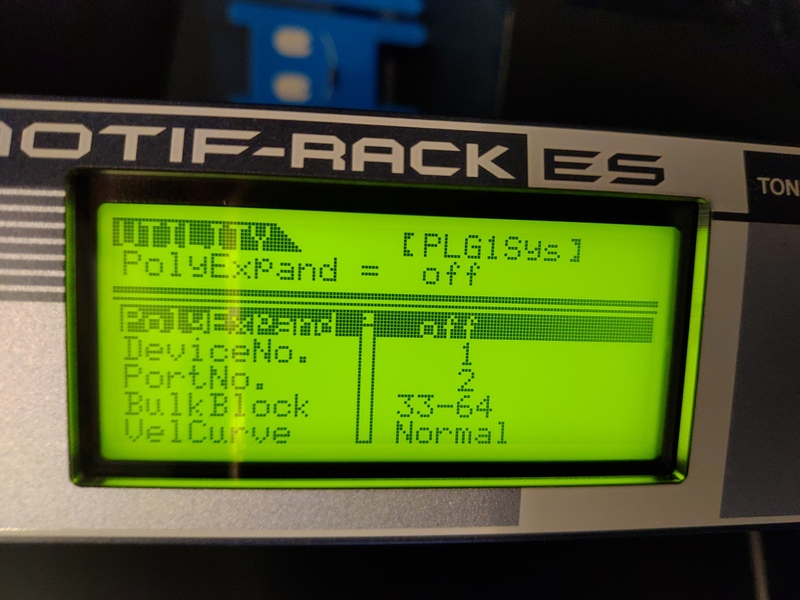 In terms of multitimbrality, you now have 16+2 parts available; the first 16 being the Motif Rack ES’s own voices, and then one part for each of the PLG boards. To edit a Multi setup from the front panel, first go to Multi mode and dial up the setup you want to edit. Then click the “MULTI” button again, to enter the multi mixing menu (button lights up red). Press the PART [<][>] buttons to select which part to edit. Press repeatedly to scroll past parts 1-16, until you get to the P1 and P2 parts. These are your PLG cards. Use the PAGE and up/down buttons to select parameters, and dial in the values. Press the [EFFECT] button to adjust effects settings. Press the [EDIT] button to adjust common parameters. Save the setup by clicking [SHIFT]+[UTILITY]. A 5-pin MIDI cable is limited to 16 channels, so to access all 18 parts simultaneously, you’ll have to connect the Rack ES to your computer using a USB cable. The USB connection offers multiple MIDI ports, each with 16 channels. The default setting has the Motif’s 16 internal parts assigned to Port #1, and the PLG cards assigned to channels 1 and 2 of Port #2. From your pictures, I can see that your PLG cards are already set to Port #2. So far, so good! The “DeviceNo.” setting is used when several identical MIDI devices are connected, and allows data to target the correct device. The AN and DX cards have individual device IDs, so you should leave those at “1”. The PolyExpand function is only useful if you have two identical PLG cards installed. In the case of two AN cards, activating this function combines the two cards into a single 10-voice part. Once you’ve done this, it’s basically a matter of activating all the MIDI inputs and outputs in your sequencer’s setup menu, and then setting the correct MIDI output port and channel for each track in your sequencer. The USB connection also allows the Motif-Rack ES to act as an external MIDI interface for your computer. Hook a keyboard to the MIDI input on the rear, and your computer will be able to record it over the Motif’s USB input port. You can also route one of the USB output ports to the 5-pin MIDI Out connector on the rear, which allows the computer to control another MIDI synth in addition to the Motif and the PLGs.